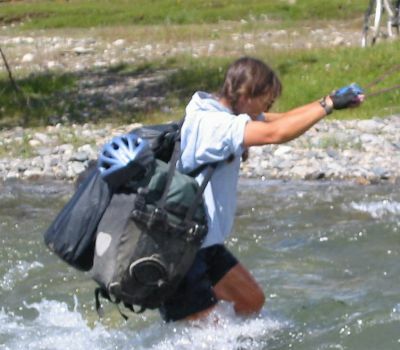 When you have to carry 15 days worth of food and can't leave your flutes and music behind, it really strains the arms to push the bike up mountain passes, even if they are well graded dirt. I have an ortleib sausage rucksack on the back rack, stuffed with all the heaviest items. I put it on to make the bike lighter to push up hill. 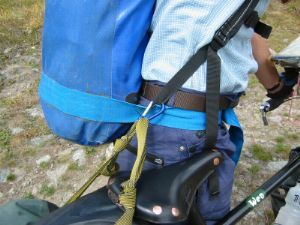 Then I tie the back rack straps to form a towing hitch, which I clip to the rucksack or to my belt. All I have to do then is walk up the hill, guiding the handle bars lightly. The towing did not work for mark who, being tall is too far above and behing the back rack. A similar system was useful for pushing through sand in the gobi. Stretches of pushing tended to be shorter here, to a campsite off the track, or through a washout. It was not worth putting the rucksac on for such short sections, so I adapted a panier strap as a belt and tied a small crab onto the backrack to clip to the belt quickly. This sounds like faff, but was well worth it because the bike weighed as much as 8 and three quaters stones due to the water we needed. Mark's bike was similarly about 95% of his body weight. Even he used this system when we spent a whole day pushing in search of sand dunes. If the water is fast, and above the knee, you will be using a rope. The smaller you are, the more hands you will need to cling on. 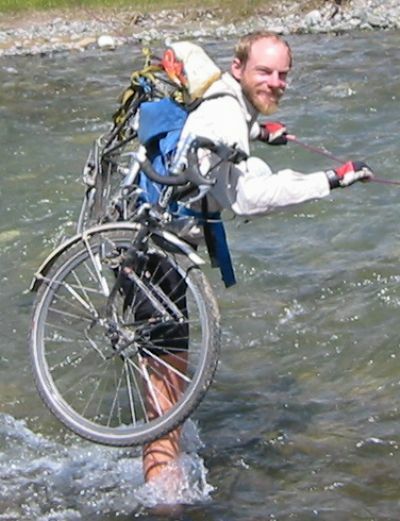 It is much better then to strap the bike to your back. For safety it should also be removable in case you fall in. Empty the ortlieb rucksack. Loop its roll down top over the cross bar. 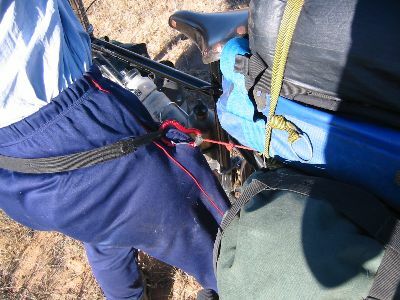 Attach a spare strap from the back rack to the rucksac for balance. 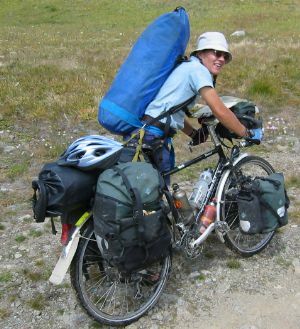 Don rucksack and bike and stand up. Check bike will not dangle too far into water and pull you over. If so put the whole arrangement on a handy taller friend. I make the two back panniers and my roll mat sausage bag into a rucksac too. I have extended the straps on the top of the back paniers so I can carry them as shoulder bags. Clip the tops of the two panniers together with the roll top closure of the sausage bag. Use a small crab to clip the bottoms of the two panniers together. 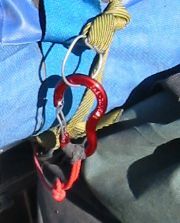 The is very stable and would come off in emergency, but leaves two hands to hold the rope.